is what’s happening here on the blog today friends! So welcome to FARMHOUSE FUN! 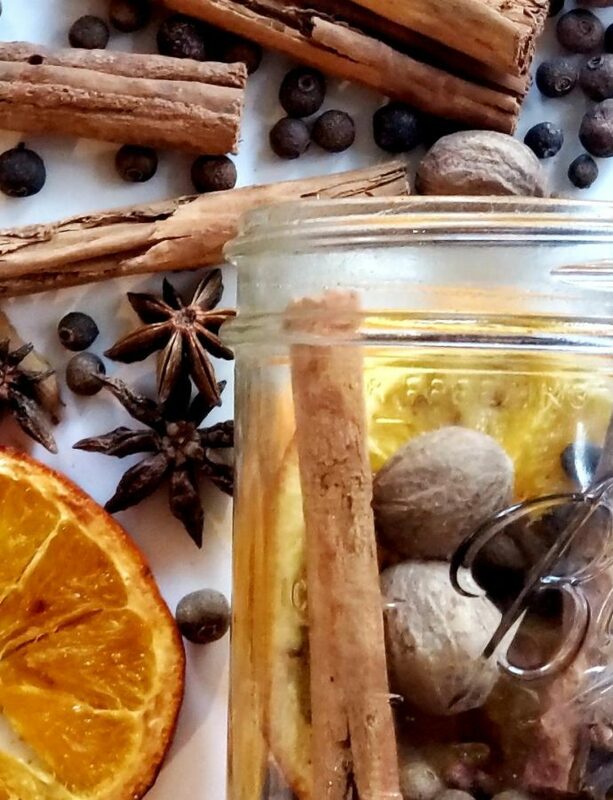 I have teamed up with a talented group of bloggers to share our “Fall-Halloween Tablescapes.” So sit back, grab your favorite fall drink and get ready for the parade to begin! Then join in on the Blog Hop Fun by clicking on my friends’ links at the end of this post! I have to say while fall is my jam, there is something about Halloween that is so special to me and our family really, too. You see, my husband and I met at a Halloween Costume Party. Then our first son was born on Halloween! It’s true, not planned, just made Halloween by 5 minutes. Then, to top it all off, our second son was born on Valentine’s Day (not planned either). I guess God knew I loved celebrating so much he blessed me with holiday babies. So, I embrace the joy and happiness of this special day for our family and never give a care to any scary thing. Our family has had so many Halloween and Birthday Party celebrations that the gathering and decorating with pumpkins have become a staple activity. 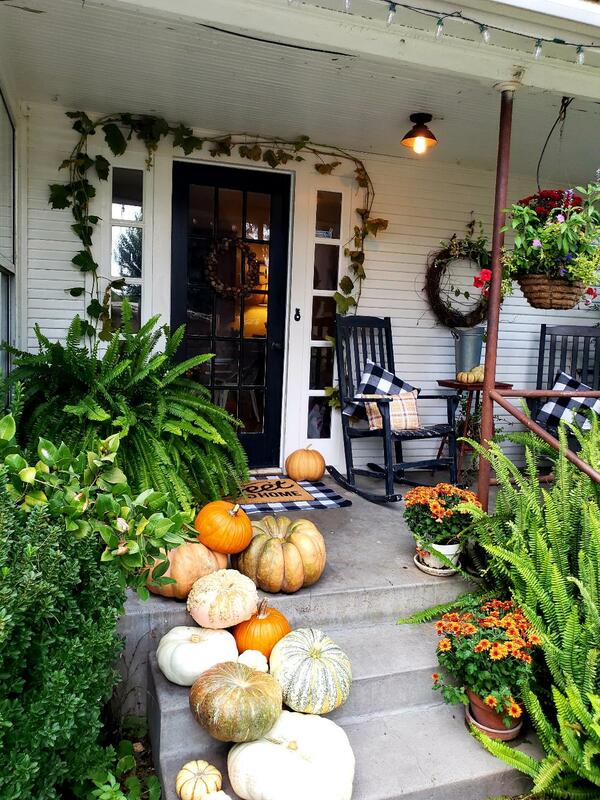 And because I really embrace this season, I like to have pumpkins everywhere, outside aglow as you can see here or just on our Farmhouse Front Porch right here. 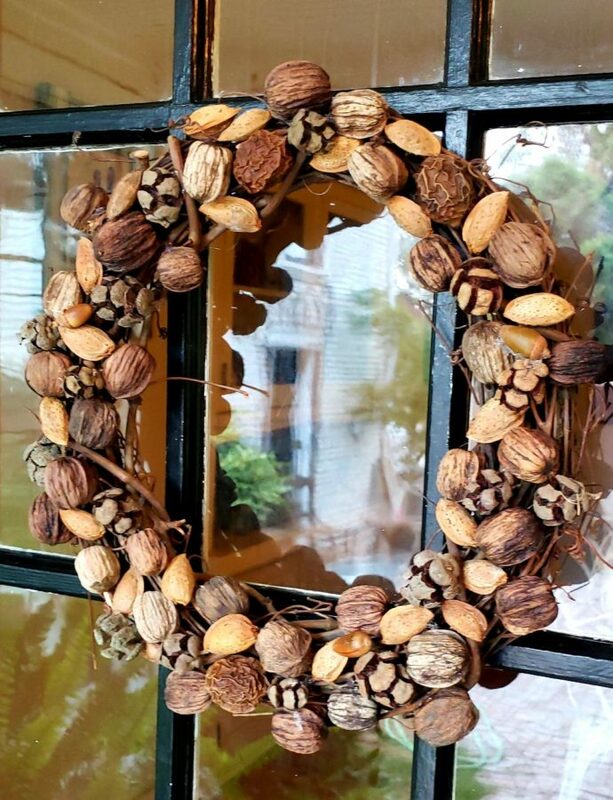 Well, as I was planning for the season this year, I really wanted these babies to go with all of my fall vignettes and that meant the table too! 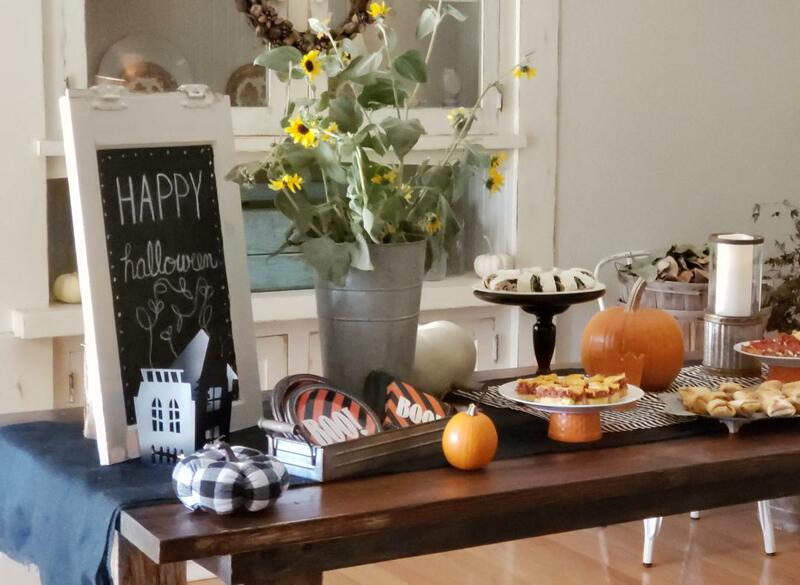 So when getting ready for our family gathering, I set up a Halloween Tablescape buffet full of pumpkins and treats that everyone might be able to simply help themselves whenever they liked through out the day. This way we could all join in (including me) on all of our fun activities that we enjoy like carving pumpkins, taking a nice fall walk in the orchard with the puppy dogs, and just visiting and catching up which is always the highlight of our family events. In order to make sure I was able to enjoy the day and not have to work during the fun, I did a little prep ahead of time to ensure this actually happened. First of all, I do love decorating so I started the day before so I could really go slow and enjoy it, then it was all prepared ahead of time. 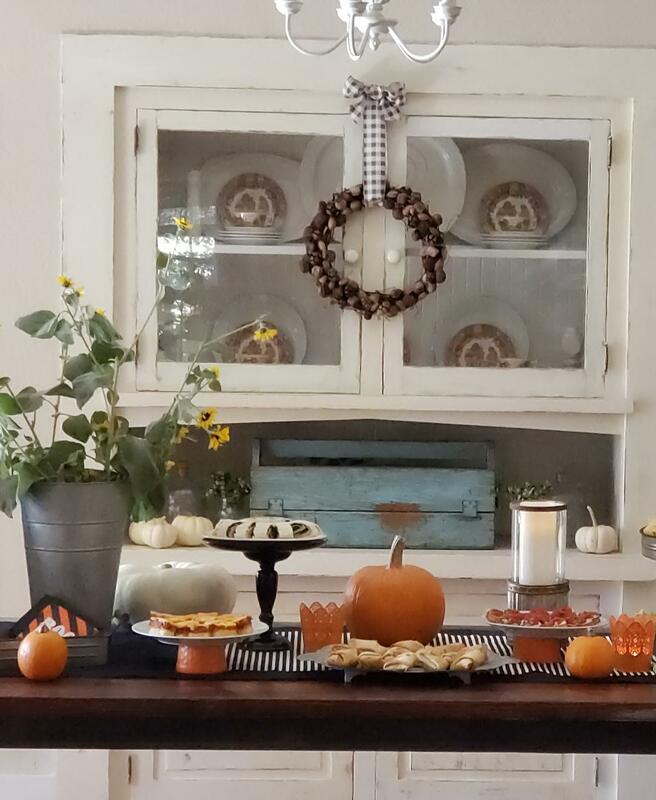 To create this tablescape, I gathered some crates that I have and of course pumpkins too. Then with these little lanterns I got new from the Target Dollar Spot, I think it added a little more of that pumpkin color. I used these candle sticks I got on clearance at Target and turned them into pedestals to display some of my treats. They also add some height and dimension to this table display and allows more room to pack in more tasty treats. I used these orange ramekins and turned them over to set a plate atop for another grouping of pedestals that added to the variety of how I displayed the appetizers. For some more height I used an old galvanized flower can and cut some of our sunflowers that are still blooming out back. It really help tie in the whole fall look and brought in a little more color. The greeting of Happy Halloween on this old cabinet door (that I turned into a chalk board by painting chalk paint in the middle area) sets the over all theme for my tablescape as one of a happy and festive one. 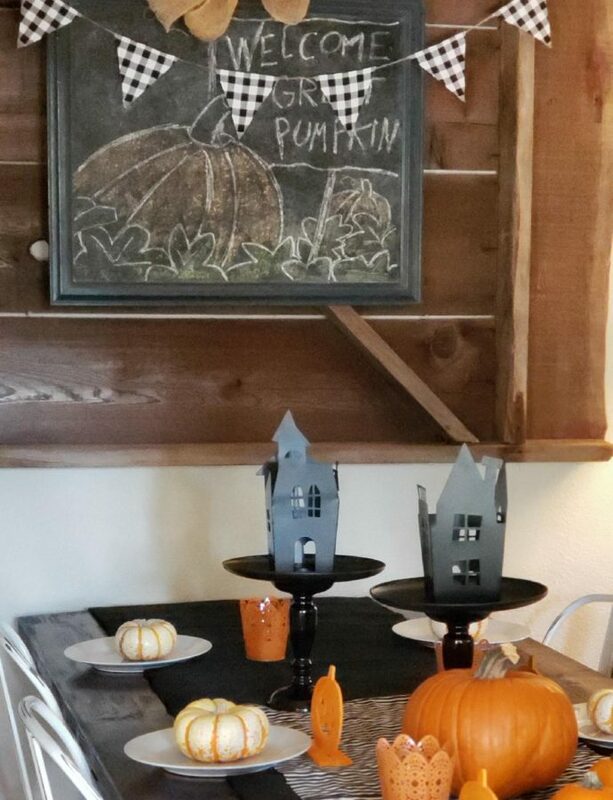 The black spooky house lanterns echo the black in the chalk board and with the buffalo check pumpkins it rounds it all out with a black orange and white color scheme. I had already fell in love with this buffalo check bunting that I made at the beginning of the season (click here for the tutorial) and strung it up right over this always here chalkboard. I change this board ever so often to go with the season or mood I’m in which for this month was an homage to The Great Pumpkin! I’m so happy with the way it all turned out and my family loved it too! What a fun time we had and usually always do! You might not have a family birthday to celebrate for halloween but you could do a Pumpkin Carving Party a few days or even the day of Halloween, before dusk. Especially if you have older kids who don’t trick or treat anymore. Invite the family over or the kids and their friends, set up a pretty buffet table of a simple and light dinner and snacks, then get to it with all of the fun activities of the night. So here’s to Halloween Holiday Fun and family gatherings! Now, let the PARADE OF PUMPKINS continue! Love how you make it a family celebration. All you did looked so yummy. The elevations and details like the chalkboard made it extra special! Happy Halloween! Thank you Susan! It was fun to do and we “all” enjoyed the day, including me! Love how you used candlesticks as pedestalsto add height and interest for your food table. I enjoy your creative ideas so much! The table looked great. Aw, thank you so much! We had a fun time didn’t we?! Jerri what a great table set up. I love all the finger foods and how you displayed them. I am sure all your guest enjoyed themselves. What great inspiration! Thank you Terrie! I loved how we all got to eat and visit and no one was stuck in the kitchen all day! Yaay for us! What an amazing spread!!!! Styled so beautifully and I love the touches of buffalo check! Goes so perfectly with your color palette! Thank you sweet friend! It was a fabulous family day and I enjoyed every minute of it! Thank you so much Maria! You are so sweet! Half the fun truly was decorating for it the other was visiting, hmmm, did I mention eating he food was fun too? It really was! Halloween is definitely special at your home! So many family ties to this fun day!!! I’m drooling over all the food. Ohmygosh… it’s all delicious and beautiful. Thank you Rita! We did have a fun time and glad I prepped ahead so I enjoyed the day as well! I love everything about this. 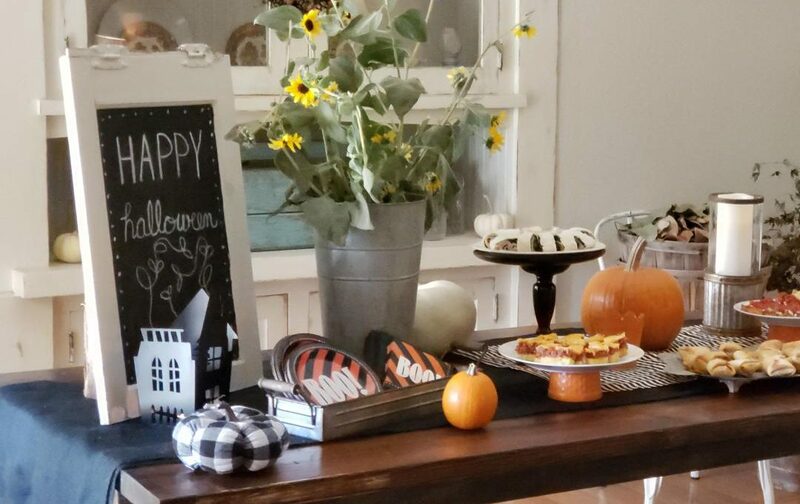 You included so many unique and cute Halloween touches that made it so special. Great job! And that’s cool that you have two Holiday babies! Thank you Laura! I loved your pumpkin carving party and Halloween Fun activities too! What a great blog hop fall tour this has been! Enjoy your Halloween my sweet friend! Looks so cute & delicious! The black & white is adorable! It’s always nice to see how you display your yummy food at your gatherings.